Magnification allows you to have a close up view of the details of an item. Our magnifiers give you a choice of power (strength), working distance (focal length), field of vision, correction and in some cases illumination. 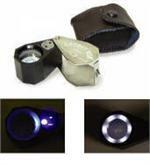 We have a selection of jewelers and watchmakers style of loupes and magnifiers. 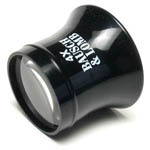 When choosing magnification, keep in mind the working distance that you will need. The higher the power, the closer you will be to the item. For example: an item magnified 10 times or 10X, will have a working distance of only one inch. The field of vision decreases as the power increases. For diamond and stone grading, you will want a color corrected, triplet lens. This will produce a clear sharp image allowing you to see any defects.